Just Mich: Introducing... Barrington, Vladimir and Benedict bears! Earlier this year I had a go at making knitted bears! Several of my close friends have had babies this year, and I have got a bit addicted to knitting them the King Cole Cuddles Chunky bears! These little dudes are knit from a pattern by King Cole specifically for the Cuddles Chunky yarn made by King Cole, and they take hardly any time at all. The yarn itself is a furry yarn, which definitely lives up to the "cuddles" in the name! 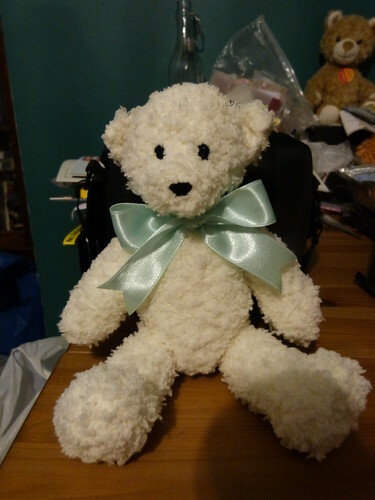 It was initially horrible to knit with, and I used much more yarn for the first bear than you need as I kept getting lost and confused, and having to start again as it's not very easy to "unknit". However by the time I finished Vladimir, the second bear, I was quite used to it, and I think if you are careful you could probably knit two bears out of one 50g ball. I started with embroidered eyes and nose, but switched to felt features out of pure laziness on the second two. I'm pleased I did as I like the effect and it takes some of the stress out, as I'm often on a tight deadline with these little guys. So... meet Barrington! He's the first little bear I knit, and he is in his new home with his new friend Noah who arrived at the end of March. I used the blue "mottled" yarn for Barrington, as I knew Noah was a boy baby, and I liked the colour pattern. This, is Vladimir! He is now in his new home with his new friend Zoe. 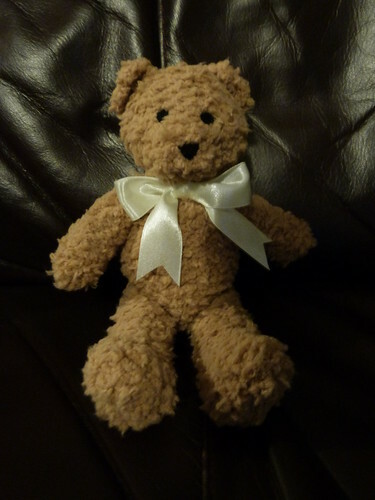 I used the brown yarn for Vladimir, who was so named as Zoe's Dad was threatening to name the new baby Vladimir (if Zoe had been a boy), so the girls at the baby shower christened the bear so he couldn't use the name for the baby! I think I like the brown yarn the best as it looks just like "proper" bear fur. And finally, this is Benedict! Benedict lives with his new friend Esme. I used the cream yarn for him as I needed a unisex colour and wanted something different to the brown I used last. He was named after Benedict Cumberbatch, as Esme's mum and I are both fans, and it's almost like "Benedick" after one of our favourite Shakespearean characters! I'm sure there will be more of these little guys - they're super quick and easy to make, and I just love how different they look depending on how tightly you stuff them, the position of the ears, and the facial features. And it's so lovely giving a new person a nice snuggly new friend you've made yourself. Have you made any snuggly friends for anyone? I'd love to hear about them.